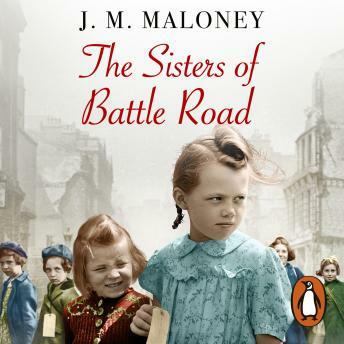 Random House presents the audiobook edition of The Sisters of Battle Road by J. M. Maloney, read by Annie Aldington. In 1939 Annie Jarman and her six young daughters were evacuated from their south London home and sent to the Sussex countryside to wait out the war. Little did they know what was in store for them or how their lives would change. From the trials and tribulations of leaving London, the destructive horror of the Blitz and terrible family tragedy to tea dances, romance and the triumphs of making a new life in the country, The Sisters of Battle Road is the compelling true story of six ordinary girls who carved out a life in extraordinary wartime circumstances. Today, the six young girls - Mary, Anne, Sheila, Pat, Joan and Kath - are six remarkable women who have lived to tell their tale of sisterhood and its unbreakable bonds in the shadow of World War Two.